Godard has written that, “literary critics often praise works…because they exhaust a certain genre, they close the doors on it. But in the cinema, we are always praising works which open doors.” While neither medium has been exhausted, certainly, in relation to literature, film is still quite a young art, and even now one more easily given a violent jolt by the singular imagination of one auteur or another. Though it too is a relatively young art, perhaps due to its apparent facility, popular music has had its share of would-be door closers. It has been said that certain songwriters throughout the twentieth century have been seekers of the end to their own medium—that they are ever in pursuit of the “perfect pop song.” To name only a few of the most obvious: Burt Bacharach and Phil Spector, Ray Davies, Lennon and McCartney, Brian Wilson. 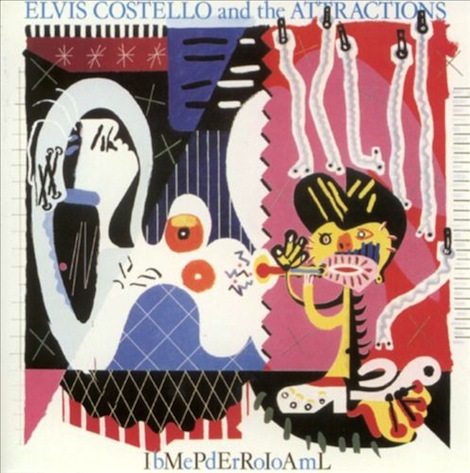 Naturally then, there have been some songwriters, often the same that sought the above grail, who since the advent of the album’s supremacy in the 1960s, have been, consciously or not, drawn to the composition of a “perfect pop album.” Elvis Costello is one such songwriter, and more than any other of his albums, Imperial Bedroom reflects this. Like the works of which Godard was thinking when he made the above comment, Ulysses and Endgame, Imperial Bedroom is at times difficult, pretentious, obsessed with its own virtuosity, hilarious and astonishingly brilliant. In addition, it is a pop album, and as such far more at home in its accessibility. It looks somewhat thin and unsatisfying when written as such, but that it is not. The lyrical content is fabulous, bringing together, among other things, button issues, crocodile tears, an oil slick, a very fashionable hovel, the bone orchard, an almost empty gin palace and a two way looking glass, The Great Barrier Reef, clammy and cunning hands, a suitably stunning woman, and rose and thistle. “Beyond Belief” is indeed the perfect song to begin this album, one endowed with the seeds of all the joys and frustrations which characterize Imperial Bedroom. “Man out of Time” is by far the most conspicuous of the songs here; the one embraced by even the more casual Spike aficionado. And it is, to be sure, notable not only for the incisiveness of its wit or its elegance, but as well for its tone, betraying as it does the narrator’s compassion for the lost souls he describes—an unusual diversion from the malicious treatment of many of the album’s other characters. Though, it is true that the malice has been toned down from the magnitudes reached on This Year’s Model. Simple in its structure— remarkable only for the oddly rambunctious intro/outro— “Man out of Time” is astonishing in the depth of characterization it achieves through a minimum of detail. They are brilliantly selected details which create a version of London by the mere suggestion of a few names, and characters that we are able to empathize with through brief sketches. Yet, it is all centered and balanced upon the plea of the chorus: “To murder my love is a crime, but will you still love a man out of time.” As with many of the best Costello songs, its ambiguity hypnotizes. These songs draw much of their potency from this ambiguity—because they conceal they also suggest. Suggest by melody, by clever turns of phrase, by reference, by choice of detail, by varied instrumentation. Imperial Bedroom is full of manic energy and it is subdued, as it is animated, by a saturnine sensibility seeking to extract life from a comatose past of disordered experiences. (This seems to engender anger less than on past Costello albums.) This is most clearly illustrated by “Almost Blue,” by its narrator’s evocation of his dead past, a dead relationship, through comparison to the present. As he expresses it, “There’s a girl here and she’s almost you…all those things your eyes used to promise, hers promise to.” The despondence of the song comes with the understanding that the vitality of the narrator’s present has been sapped by his consciousness of its swift dislocation into past occurrence, and as such, lifelessness. There are plenty of other fascinations included here. The surprising declarations of love in “Human Hands” which are woven into swirls of piano and the pomp of “perfect pop”; the fabulous animosity of “Little Savage,” made evident only after he has declared “I would have waited all my life just to make love out of something other than spite“; the intoxicant melodies of “Little Fool” and its paternal admonitions. There are plenty of female characters verbally brutalized in Costello songs, which makes “Little Fool” all the more touching and disturbing. He suggests that some sort of intervention, beyond her mother’s comprehension of course, could have changed its subject’s fate—but at the same time he seems to accept this fate as unavoidable. This ambivalence is more comprehensible if one takes into account the following and final song. “The Town Crier” unambiguously identifies Costello with a melancholic figure. This is an acutely self-aware figure who perceives himself and his lack of capacity in certain areas. While “Other boys use the splendor of their trembling lip / They’re so teddy bear tender and tragically hip” to get what it is that they want (in the carnal sense to be sure, but in a broader sense as well), the town crier is forced to find comfort in his own thoughts and in his own tears. In his recollections of an insufficient past, and in the project of composing a better self; in his willful ambition to never cry again, to be a stronger man despite the suffering that is his world. And so we are left in the end: a dramatic sweep of sound and syllables, of meanings and suggestions which coalesce only in the bittersweet satisfaction of beginnings without endings and questions without answers. Of ideas without resolution.